Grapes should be planted in early spring, as soon as the soil can be prepared. Cut off long broken roots so that they can be spread evenly in the planting hole. Set the plant slightly deeper than it grew in the nursery, arranging the roots so that they are not bunched together. After planting, prune back to two lateral buds. Cultivate the young vines until they become established. Best results are achieved by training to a trellis. Beginning fertilization similar to raspberries is good for a start. DO NOT fertilize if vines show excessive growth. Grapes are very sensitive to many chemicals, particularly herbicides containing 2-4D. Keep this chemical as far as possible from your grapes. Captan will control harvest season rots if used according to the label. Varieties of grapes are adapted to most climatic conditions. You are limited only in arid sections where irrigation is impractical. Also, you should have at least 170 frost free days for proper maturity of some varieties. If you live in an area with extremely severe winter temperatures with no real protection, it will be difficult to grow some varieties. Areas with high temperatures and high humidity present problems because grapes are susceptible to diseases which thrive under these conditions. 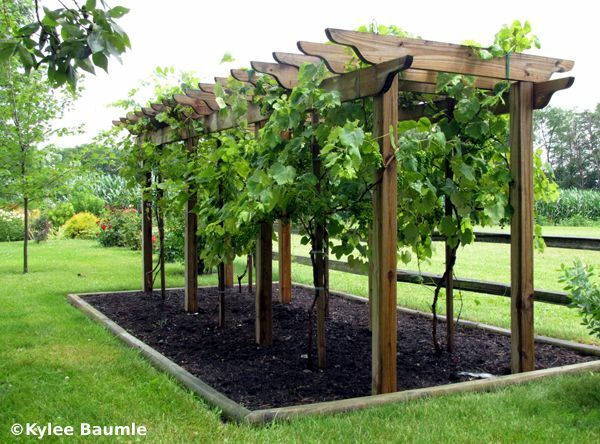 Grapes will grow in many different soils--even soils of sand, gravel, shale, slate or clay. Vine growth is generally improved by adding organic matter to the soil. The soil exerts considerable influence on the crop. Very rich soils and soils containing high organic content produce a heavy, but late-maturing crop with a low sugar content. Light soils tend to produce light yields of early-maturing fruit with a high sugar content and comparatively weak vine growth. Patience is the virtue in starting your new vineyard. Often, it can take many years to reap that first big harvest. Be patient. Once the grapes are established and properly maintained, they will give you many years of bountiful harvests. The Concord variety has that true grape flavor and has been planted for a century. It is hard to beat for home gardeners or commercial sales. It is a late ripener. Used for wine as well as juice and jelly. Grapes are smaller than regular Concord and will have an occasional seed. The flavor is the same as a regular Concord grape but slightly sweeter. The concord seedless generally ripens 1 week earlier than the seeded Concord and is excellent for pies, jams, jellies, and wine. Once the vine becomes established it shows improved vigor and productivity. Hardy in zones 5-9. Fredonia has a wonderful flavor and superb quality. This is the BEST of the black grapes. It is early to ripen, large and is promising. Ripens 2 weeks earlier than Concord. The hardiest of the white seedless. It is of the finest quality for eating. Ripens in mid-August in Zone 6. The vines do well in warmer areas of Zone 4, 5 & 6. Hardy to -15. A vigorous blue seedless grape. Clusters are medium-sized and well filled. Vines are reasonably hardy and resistant to several major diseases. Mars is one of the last to bud out in the spring, which helps it avoid the late frost. Vines may bear fruit quite heavily therefore production should be controlled on young vines to prevent delays in establishment. Slipskin. This white grape ripens mid-season and produces an abundance of clusters of large flavorful fruit. It is an excellent white grape. Great for juice, wine and eating. This grape is VERY winter hardy. It has large clusters and is an excellent table grape or can be for commercial uses. It is good all over the Midwest. Hardy to -34. Medium size fruit. An outstanding new red seedless! High quality round, spicy-sweet fruit. Attractive, bright red berries hang in long loose clusters. A fine table grape that ripens in early September. It's hardy to about 10°F. Named at Geneva in 1972, it's excellent cultural characteristics and high wine quality make it a promising variety for the future. Cayuga is one of the most productive and disease-resistant grapes grown in the eastern U.S. It's highly rated wine has medium body and good balance. This versatile grape can be made into a semisweet wine, or, using oak aging, can be made into a dry, less fruity wine. A black grape that ripens very early with small berries and clusters, has hardy vines with medium vigor and production. A very popular red wine grape that produces wine in styles ranging from fruity, light red table wines to hearty, full bodied reds. A new commercial red wine grape from Cornell University in New York. Geneva Red is very disease resistant, vigorous and a heavy producer with good cold hardiness of -25 to -35 degrees. Makes a fine dark red wine with a classical dybrid aroma. A great selection for commercial growers and home gardeners where winter hardiness is a concern. Indiana's Signature Grape! A Gewurztraminer hybrid from the Geneva Breeding Program. Named in 1996, this hybrid produces wines of excellent quality, spicy and aromatic. The vine is much more winter hardy than its Gewurztraminer parent. Productive and moderately resistant to Powdery Mildew. Hybrid of Trebbiano, the Italian white Chiati grape, which it resembles in both wine and vine. Medium to very large, compact clusters. Small, white grapes. Its wine has a good aroma. Vidal is a vigorous, moderately hardy, heavy producer. Mildew resistant. Foliage sometimes shows spots of mite damage which, however, are self healing. Ripens late. Hardy to -5 degrees F. Originated in the French Cognac district. Source History: 4 in 1988 and 1992.